Thursday, Friday, and Saturday, June 6,7,& 8, 2019 in Dalton, Georgia. The theme is Milling Around Old Cherokee Georgia. This northwest portion of Georgia was a part of the Cherokee Nation from about 1750 to 1838. While here, the Cherokee brought water-powered milling technology to the region. Even after the Cherokee left on the 1838 Trail of Tears, the area was still known as Cherokee Georgia for decades. 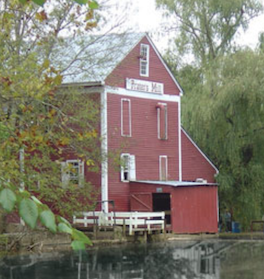 "While no Cherokee mills exist today, we will visit Dew's Pond Mill which is built on the site of a Cherokee mill," says Melanie Millican Chapman, president of the Prater's Mill Foundation, Inc. "At Red Clay State Historic Park, we will see the main bearing and a millstone fragment from the Brainerd Mission Mill build in 1820." and Berry College Mill, built in 1930 by Henry Ford. and bus tours of interesting mills in the place the Cherokee called The Enchanted Land.